Eurofer will host an extraordinary press conference today as the European Commission weighs up its response to the US' announcement of tariffs on steel and aluminum imports. In oil, Africa and its refining sector are in the spotlight this week, as the AGM of the African Refiners’ Association opens in Cape Town today. Meanwhile, the market will also be looking out for reports from both OPEC and the International Energy Agency, on Wednesday and Thursday, respectively. Finally, in natural gas, key Dutch announcements are expected on the production quota for the giant Groningen gas field, plans for the phase-out of coal-fired generation, and the winners of the latest Dutch offshore wind tender. Our social media question for this week: What are the biggest challenges for Africa’s refiners? Tweet us your thoughts with the hashtag #PlattsMM. In this week’s highlights, African refiners gather for a key meeting in Cape Town; North Sea crude prices are expected to fall; and the Dutch economy minister is in for an energetic few weeks. But first: European steel industry association, Eurofer, will host an extraordinary press conference Monday as the European Commission weights up its response to US President Donald Trump’s announcement of tariffs on steel and aluminum imports. Flying in the face of criticism from the international community, Trump last week pushed the button on tariffs of 25% for steel, and 10% for aluminum. The tariffs would include all countries, except for NAFTA partners Mexico and Canada. 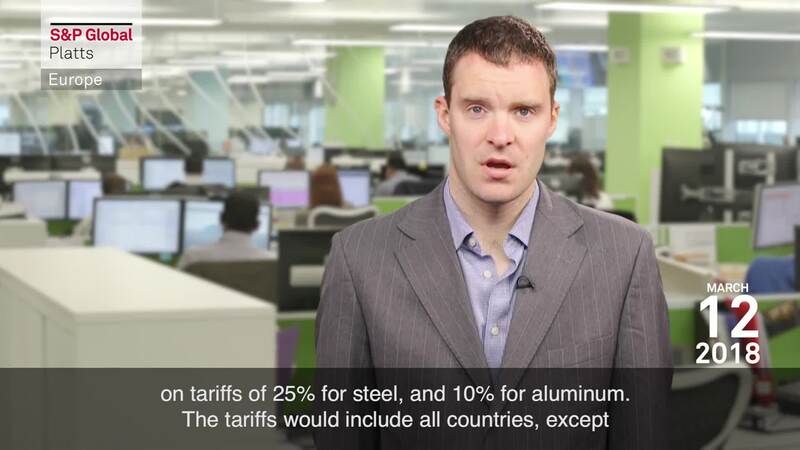 The EC has said it will respond quickly, with the steel industry suggesting either a tariff or import quota to protect the EU market from a potential surge of redirected metal. More broadly, the market will be watching closely to see what countermeasures are put in place by the US’ trading partners across the globe. These could have ramifications across a range of commodities. In oil, Africa and its refining sector are in the spotlight this week, as the AGM of the African Refiners’ Association opens in Cape Town on Monday. The continent’s shortage of up-to-date refining capacity will be in focus, along with plans for new refineries in Nigeria, Kenya and Egypt among others. European refiners also have a strong interest in developments, given how much fuel they export to Africa. That’s the subject of this week’s social media question: What are the biggest challenges for Africa’s refiners? Tweet us your thoughts with the hashtag #PlattsMM. The market will also be looking out for oil market reports from both OPEC and the International Energy Agency, on Wednesday and Thursday, respectively. These should shine a light on recent falls in the oil price and the impact of the US import tariff announcements. In Northwest Europe, the outlook is bearish for the Brent, Forties,Oseberg, Ekofisk crude complex as the market moves into April. Poor arbitrage opportunities to Asia, and limited buying interest in Europe, are expected to weigh on prices of North Sea crude. March was a relatively bullish month, with two to three very large crude carriers taking North Sea oil out of the region. Come April, market participants expect lower official selling prices in the Middle East and the Dubai structure moving into contango to dampen demand from Asia. Meanwhile, oil that stays in Europe faces stiff competition from Russian Urals blend. As you can see from the chart on your screen, the premium of Forties to Urals is currently the highest since September last year. Finally, the Dutch economy minister has a busy couple of weeks coming up. Key announcements are expected on the production quota for the giant Groningen gas field, plans for the phase-out of coal-fired generation, and the winners of the latest Dutch offshore wind tender. Eric Wiebes is set to propose a new cap on Groningen output this month. The regulator has recommended production be limited to just 12 billion cubic meters a year to prevent earthquakes. The current quota is just over 20 billion. The minister is also set to provide an update on how the Netherlands plans to phase out its coal-fired power plants in the coming weeks, against the backdrop of the situation at Groningen. Offshore wind power could pick up some of the slack. Norwegian oil major Statoil and Sweden's Vattenfall are currently offering to build a subsidy-free offshore wind farm. That would be a world first.